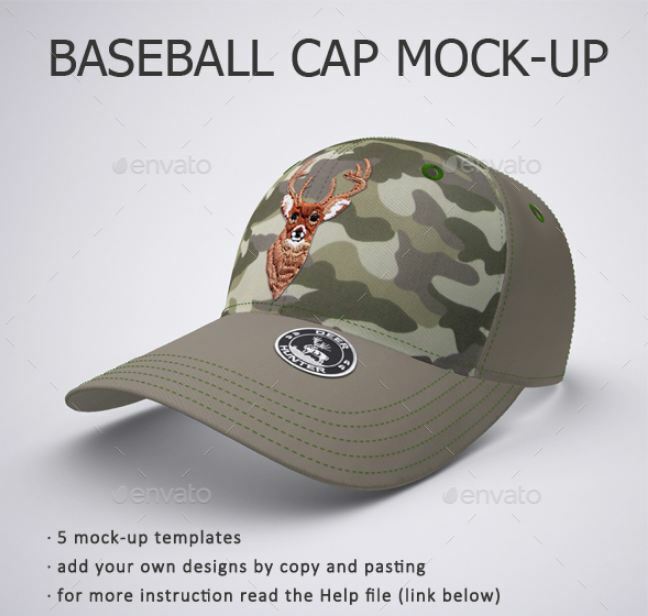 Hello Reader, we have created a mega cap mockup psd template collection for designers who are searching various hat mockups for their custom cap design projects. 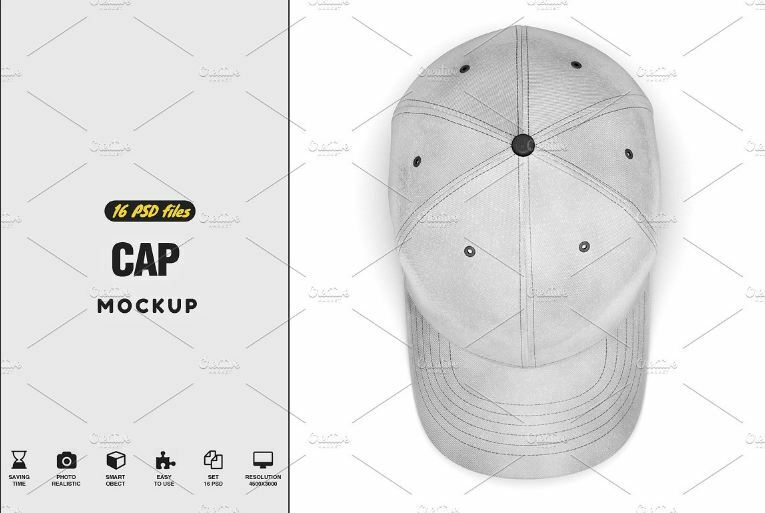 We have included all sorts of cap mockups here, so you won’t have to individually search for them anymore! Feel free to bookmark this page for future reference, will save some time! 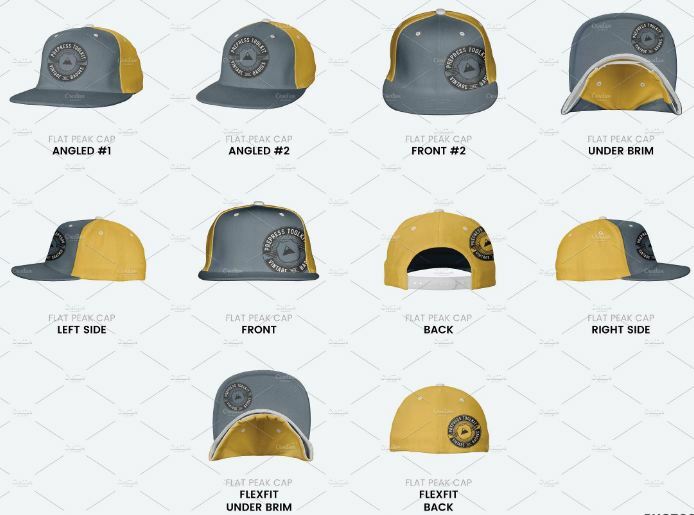 Please note that, Whatever sort of cap mockup you are searching for, we might have included that in this collection, so please look closely to see if you can find the mockup of your need. You can use ctrl+f to quickly search the page or feel free to use the search bar at the right corner, thanks! Yup, bike cap mockup with 2 different style. 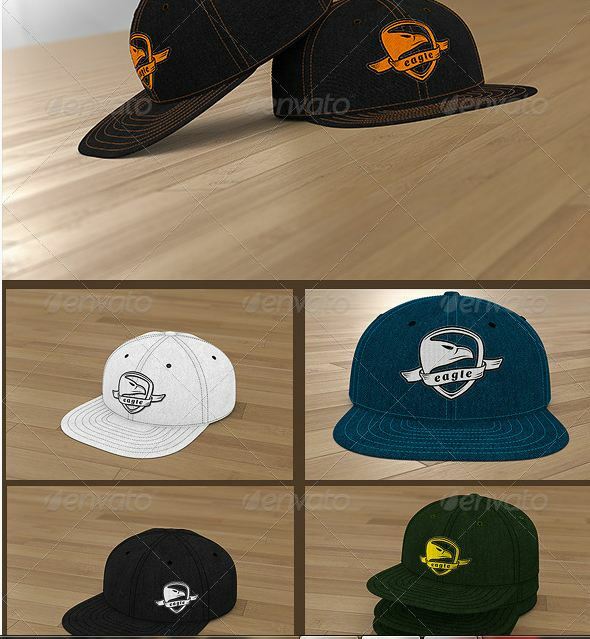 Here you will get premium quality black hat templates to create beautiful snapback caps for your onlie apparel store. Looking for interesting camp hat mockups? Then this pack is for you. Easily change and edit all the design sections (buckle, stripe, all panels, visor edge, circles, hole) etc. and turn on or turn off round and rectangle patch to include new design. 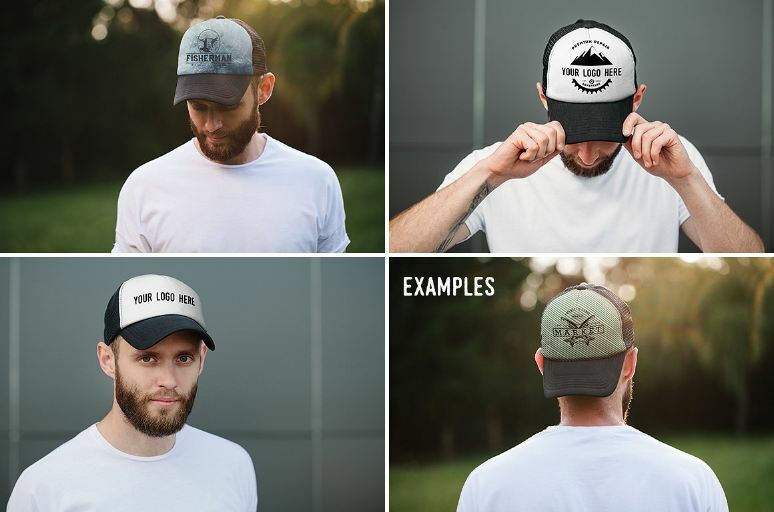 This trucker hat mockup pack contains 4 different trucker hat template. File size 5616×3744 px. 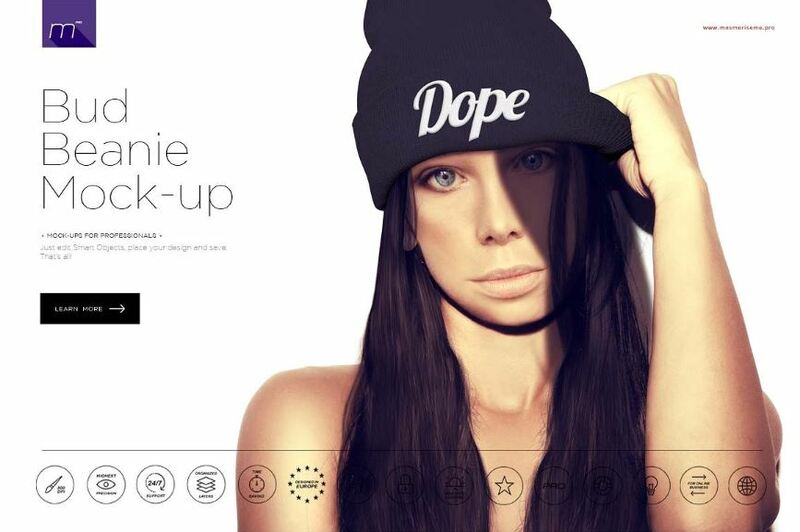 A Sun Visor Hat Mock-up, includes 2 psd files, size 1920×1440 px and resolution 72 dpi. 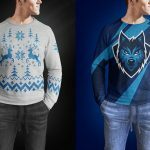 Have options for including embroidered design. 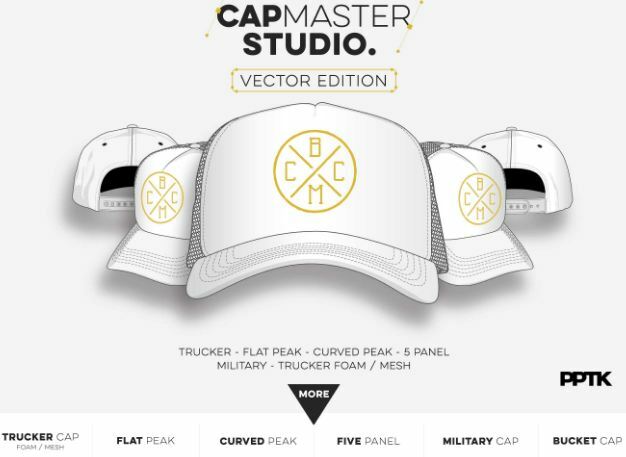 If you are looking for cap vector templates for Adobe Illustrator, then this master vector edition set is just for you. 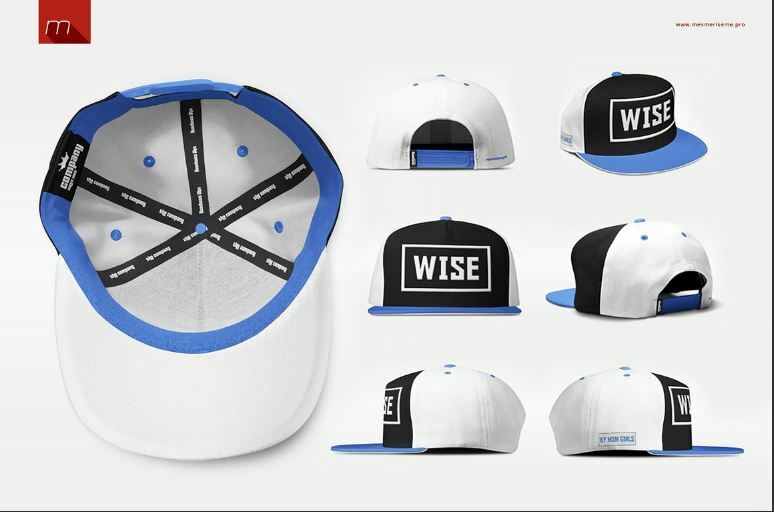 A simple yet nice baseball hat template created by Mock-up Store. File size is 2500×2000px and resolution 300 DPI. 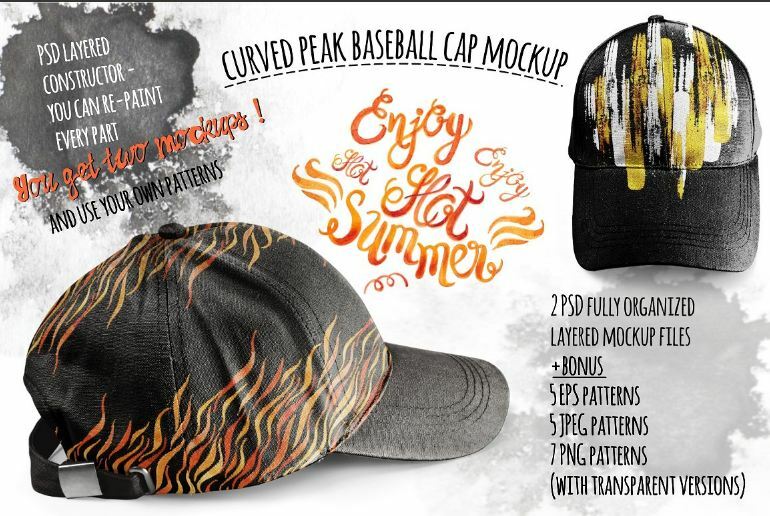 A Curved peak baseball cap mockup template pack from “Seamless and more stuff” and 17 hand-drawn watercolor and ink fire patterns (EPS, JPEG, PNG) you can use to create beautiful baseball caps. The demo images, as you see, all the original caps photographed in the studio to help you create photo-realistic pictures. This pack is from Alexander Georgiev, you will get 7 PSD files with 7 different views to create professional baseball hat demo images. File resolution is pretty high- 3840 pixels X 2160 pixels, will also get perfectly isolated shadows, objects and reflections to create photo realistic images. 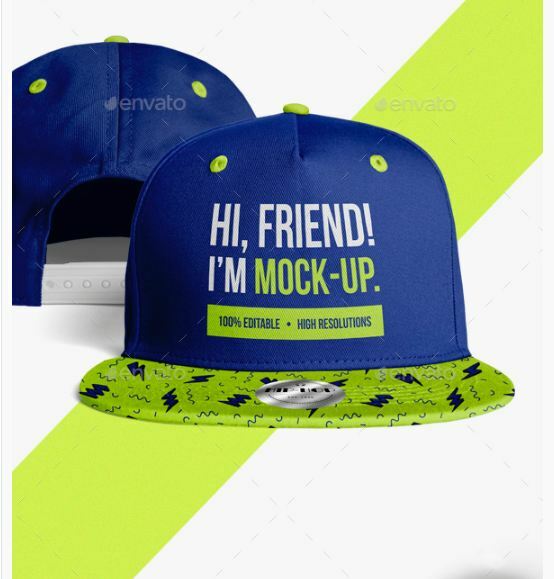 This baseball hat mockup is from Creative Mockups, includes 1 PSD file. Resolution 3840 pixels X 2160 pixels. Create simplistic an plane Baseball Hat design presentation just by editing the smart objects in Adobe Photoshop. Premium Beanie Mockup for Photoshop is from Pixel Sauce, includes ready made 200+ American Apparel colors to choose from, 2 views and 4 color swatch libraries. Looking for bud beanie mockup psd? Here is a one with models wearing bud beanies. Pack includes 2 psd files sized 2500×2500 px and resolution 300 dpi. Front view and view on model is separately included, can change the gradient and color of all parts of material. A knitted beanie mockup from mocca2go, you will get 2 PSD files sized 2500×2000 px and resolution 72 dpi. You can also add badges with your own patterns or designs. A baby cotton beanie hat mockup set provided by design shop Mocca2Go on CreativeMarket. 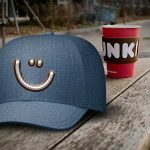 This is a all in one cap mockup generator pack in just one PSD file so that you can generate beanie hat images in various angles with just a few clicks in Adobe Photoshop. 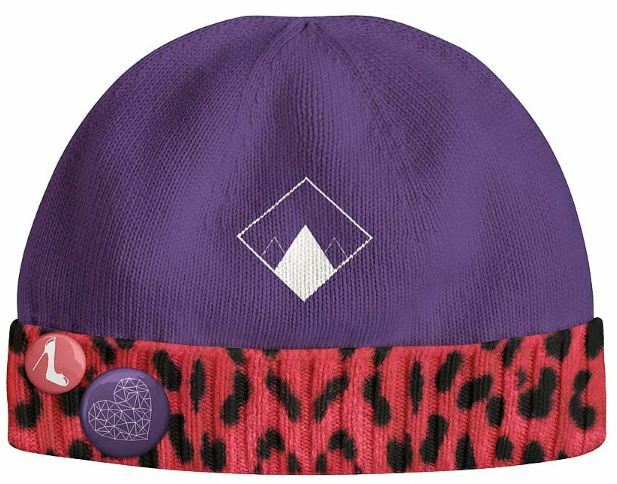 Add your own designs and labels in the beanie hat and change the backgrounds with your preferred color/design. This is a huge collection of Photoshop mockup pack includes eleven Flat Peak Cap templates created by PrePress Toolkit in CreativeMarket. With it’s detailed templates, you will be able to effortlessly color any of your panel of the cap. You can choose from wide range of perspective that this flat peak hat template pack provides, fron-on perspectives/angled front or top-view perspectives. This cap mockup psds will be good to prototype your designs before you go through the ciostly and hectic process of sampling and printing. Create showcase images with your design is as easy as copying and pasting it into the smart object section, realistic 3D mapping will be applied to your work instantly, setting the design to the folds of your hat panels to make sure it gets a photorealistic finish. 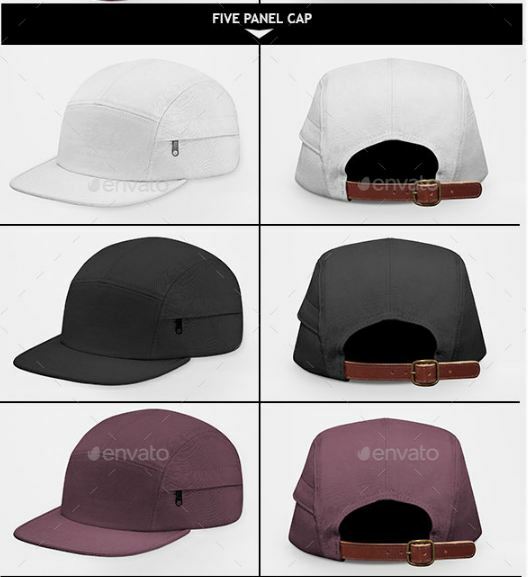 This flat peak cap mockup pack includes- flat peak front profile, flat peak snapback profile, flat peak flexfit back profile, flat peak snapback side profile, flat peak under brim profile (Snapback + FlexFit) and 3 anglesd front. 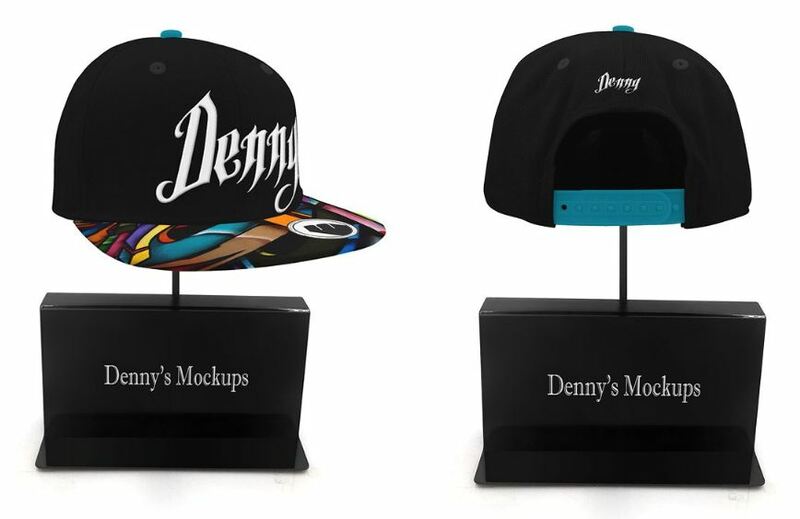 A full cap mockup set for your embroidered hat design presentation. Editing this file will require minimum Photoshop 6. This pack includes 3 layered PSD files with 3 different angles/views, file size: 2000×2000 px and file resolution is 300dpi. 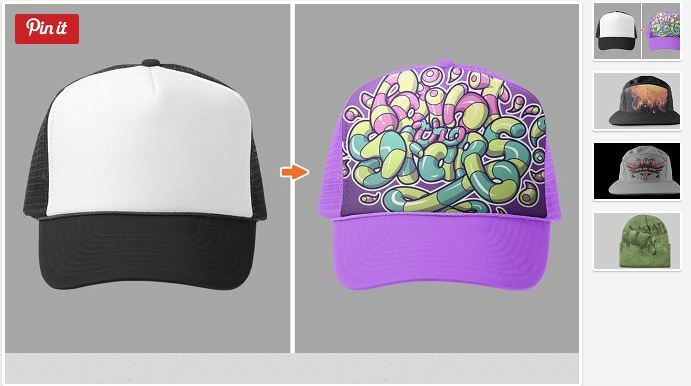 Change your dad cap’s color and design through smart objects. You will get three views side, front and back also will get gray melange options. Author also added dyed version on the latest update. 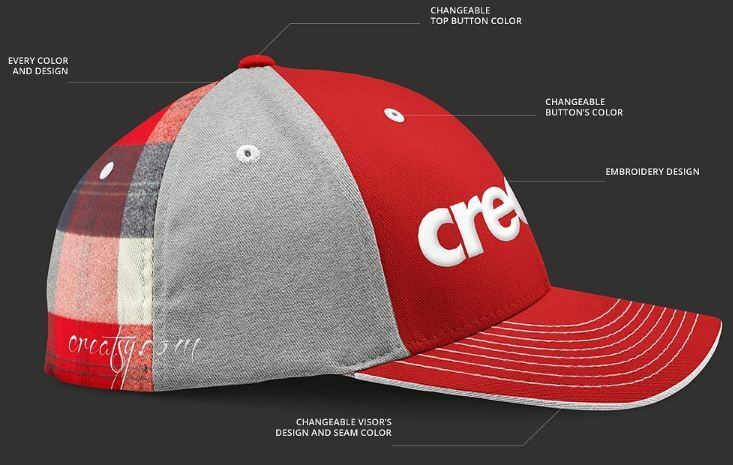 A standard snapback mockup design pack from creatsy. Pack includes 4 PSD files with 4 different views (front, back, Side right, side left), file size: 2000×2000 px and resolution 300dpi and gray melange options. 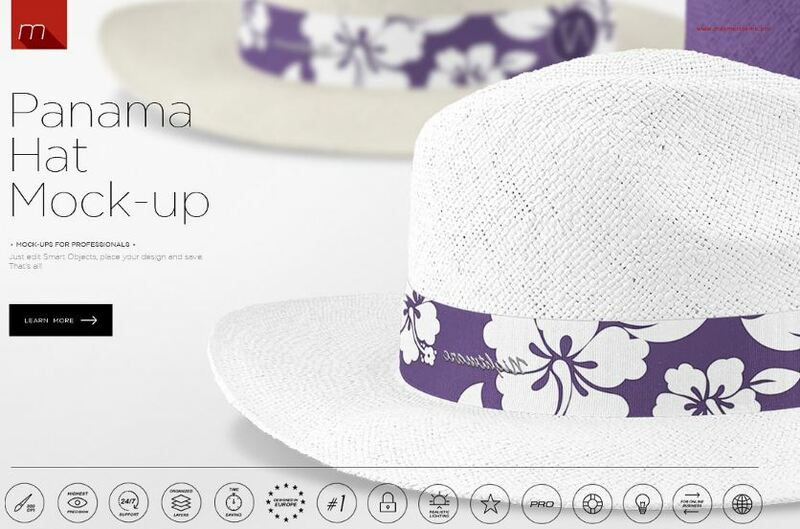 An interesting panama hat mockup design template from Mocca2Go. If you are trying to create delicate design presentation for your panama hat then this is the panama hat mockup for you. You will get 2 psd files 2300×1500px with resolution 300 dpi, two different angles, option to change color of each part of material. A very interesting cap mock-up from shaman in CreativeMarket. This hipster cap mockup pack includes 1 psd file for Adobe Photoshop along with a help file for end users. File size 2000x1500px and resolution is 150dpi. To create simple yet catchy hipster cap presentation. 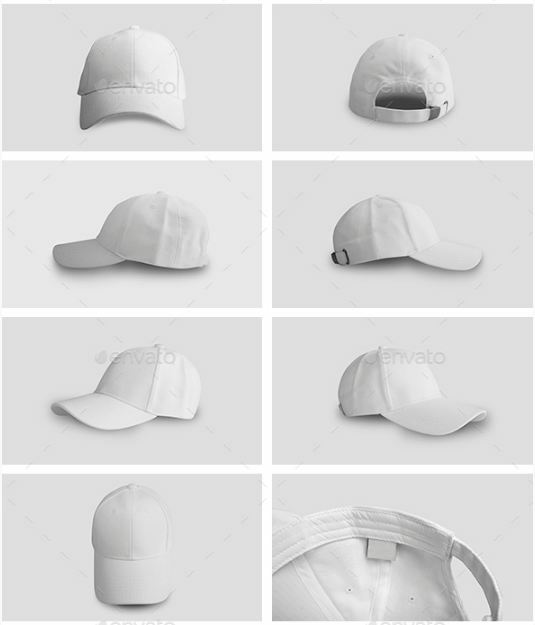 A fantastic dad hat template set to create compelling dad hat presentation for your dad hat products, the set is created by PixelMockup in CreativeMarket. This dad hat mockup is ready for Photoshop so that you can edit and transform your images in angle included with just a few clicks. You can edit the reflection, Z depth pass, Specular light, Shadow, Main light effect and Background . This dad hat mockup is created for highly professional usage, with detail design in mind. 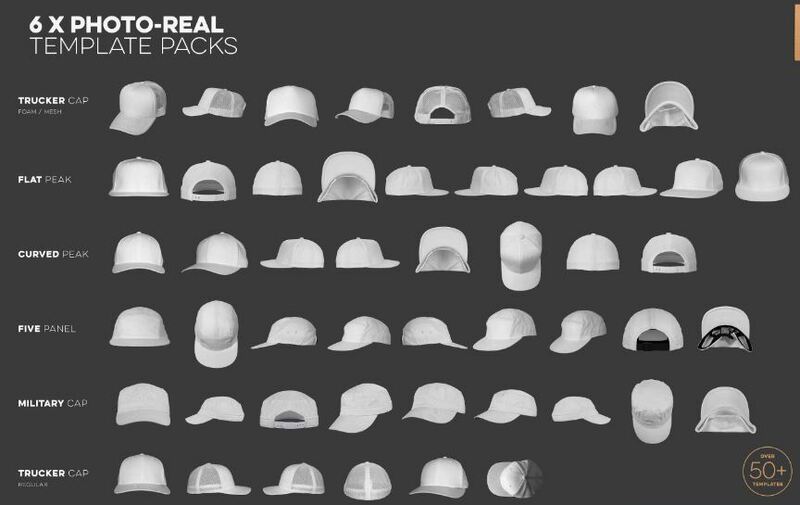 Pack includes 16 dad hat template psd files. This is a standard six panel dad hat mockup template with sandwich trim and stitching created by Tomjohn Design in CreativeMarket. Create beautiful dad hat showcase with your designs for dad caps. Edit and create from different angles, all the psd files are well organized with properly named layers. 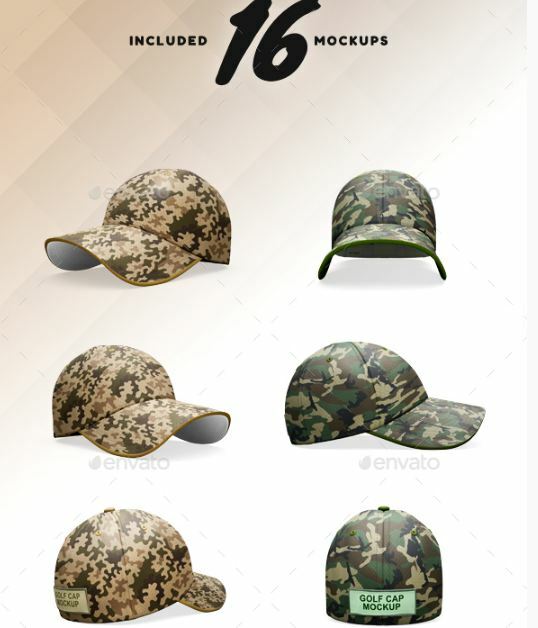 A fantastic hat mockup template pack created by Go Media’s Arsenal in CreativeMarket which includes dad hat mockup, 5 panel hat, Beanie, Pom Pom Beanie, cuffed beanie in flat view, Ball cap, Cuffed Beanie in a Ghosted Side View, Flat Billed Snap-back Hat, Headband, Trapper Hat and Trucker Hat. 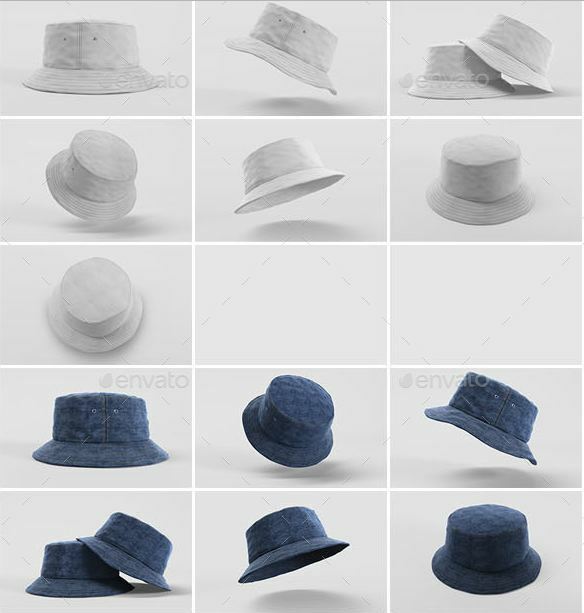 Collect this for any of your future hat mockup template needs and create beautiful showcases easily in Photoshop. Trying to create presentation for a swim cap for a client? This Swim Cap Mockup Set will help you to showcase your designs on a cap made for swimmers. 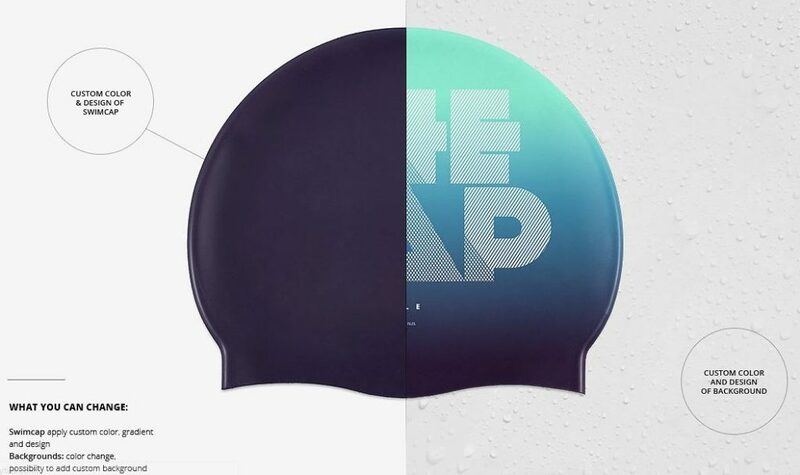 This swim cap mockup is created by creatsy, apply custom color, gradient and design of your choice to see how it looks. 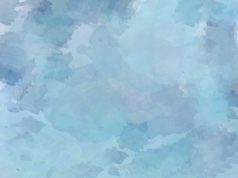 Includes 3 backgrounds- wet surface, custom color, neutral and white- you can check them out in the preview images. A hard hat is a sort of helmet people use in workplace/industrial/construction environment to protect their head from sudden injuries. There are not so much templates for hard hat is available on the net. Luckily, as usual, Creatsy shop got us covered. 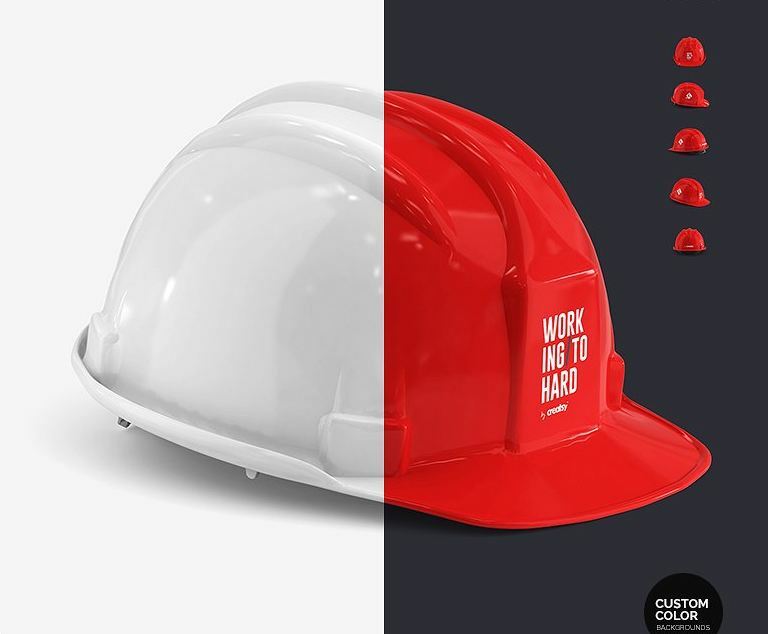 This hard hat mockup pack includes 5 PSD files with 5 different views, file size: 3000x3000px and resolution: 300dpi. Amazon ready photo realistic views with option for several custom backgrounds. To show your clients the new snapback cap designs before going for embroidering or printing physically, this snapback mockup psd pack by GunzKingzArt could come really handy. It is designed by good designer Iván Díaz for GraphicRiver community. 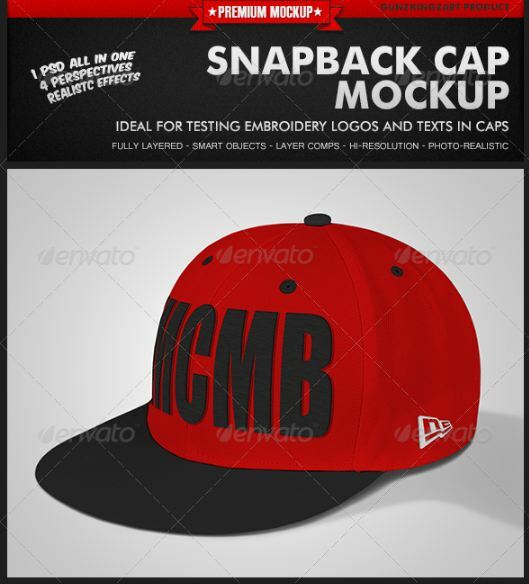 This snapback hat template would be great to test out your designs, embroidery logos or texts in photo-realistic snap back caps. You will need Photoshop Cs4 or later versions to use this template. Features include easy customization with smart objects, 4 models with 4 different views in one Psd file, resolution – 72 dpi, size – 1534 × 1300 pixels and RGB color mode (can change it to CMYK for print). 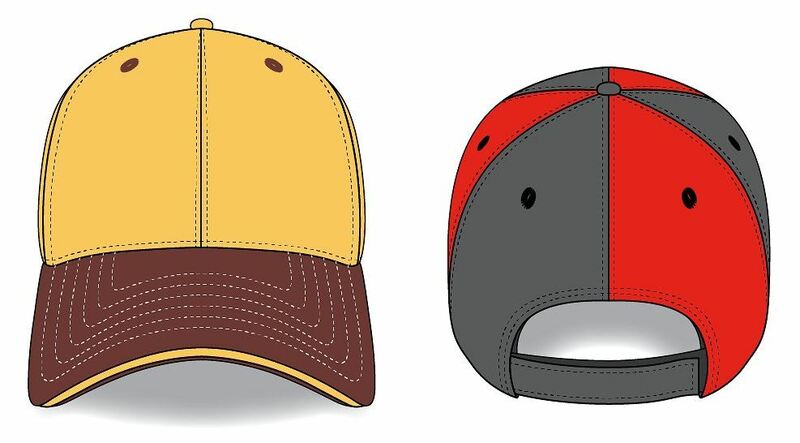 Looking for a simple baseball cap mockup for the designs you created for your sports team? This simple mockup pack comes with 9 blank templates of soft cap with a rounded crown and a stiff peak projecting in front, from 9 different angles. The set is created by HiMockUp. Get your photo realistic result just with a few clicks in Photoshop. 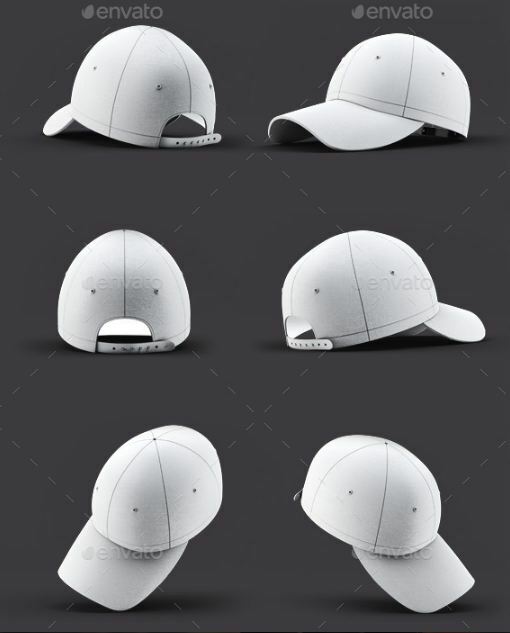 An awesome golf cap mockup template set for your next golf cap product design or golf related apparel branding – created by zlatkosan1 design house. 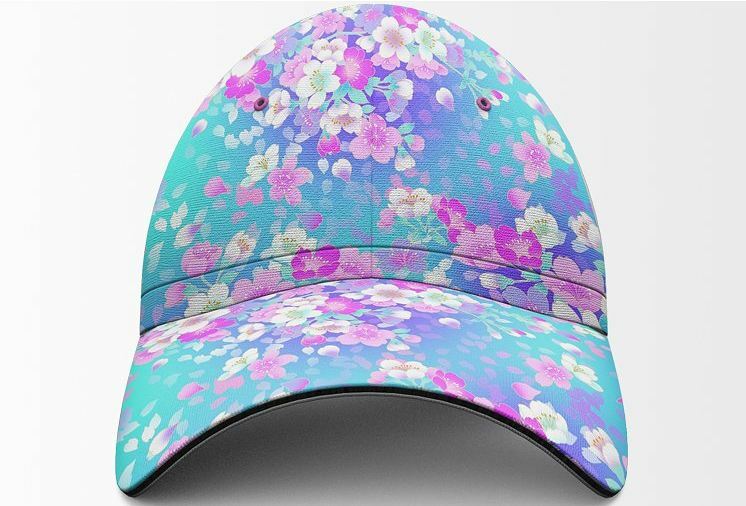 You will get professional pre-made scenes which would be great for to showcase your golf cap via websites, golf cap product presentations, advertising and so on. Features include Fully layered and Easy to use psd files, Organized Layers, high resolution Print quality files 4500×3000px 600 dpi, Professional Reflections, Perspectives with Clean Look. Author have also included help file to get you started with the mockup set. 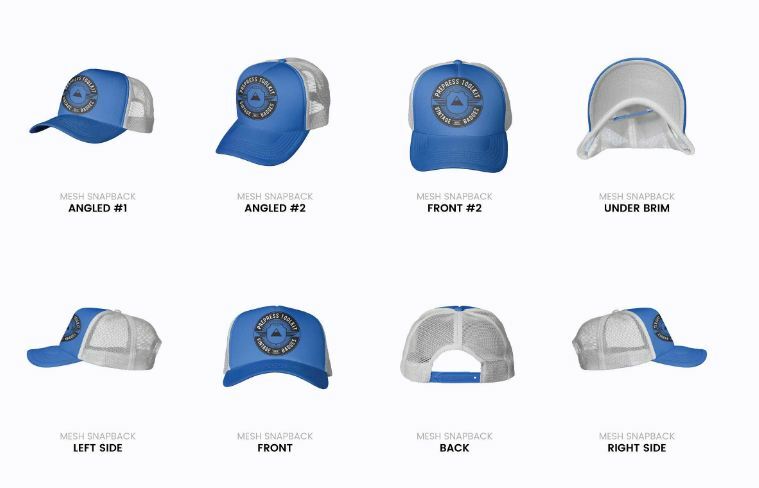 A gorgeous set set of Baseball Trucker Hat Template (also known as Needle Hat / Fitted Hat) from bangingjoints. This pack includes seven types of hat templates- five panel cap, baseball cap, stripe cap, full cap, six panel cap, Heathered five panel full cap and of course trucker hat. Easily customize through smart objects to get your desired most real and clear look of the product image. You will get unlimited colors to choose from with 14 different shots. Size 2290×1570 pixels with resolution: 72 dpi. The pack contains a total of 14 psd files to be edited via Adobe Photoshop. Please note that the logos shown in demo images are not included in the pack. 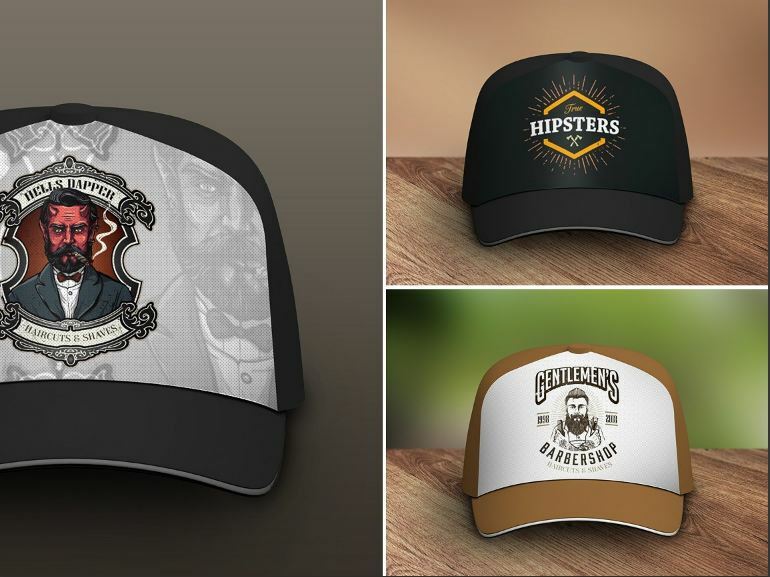 A fantastic baseball cap mockup template from grapulo. 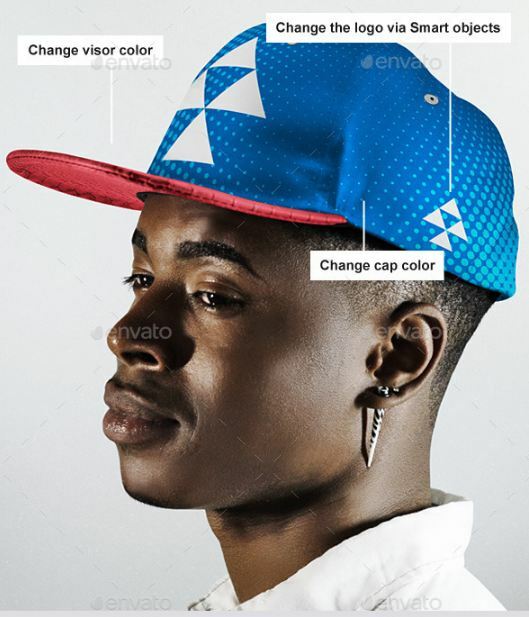 A very much photo-realistic mockup where a black model is wearing the baseball cap, would be great for your product demonstration. 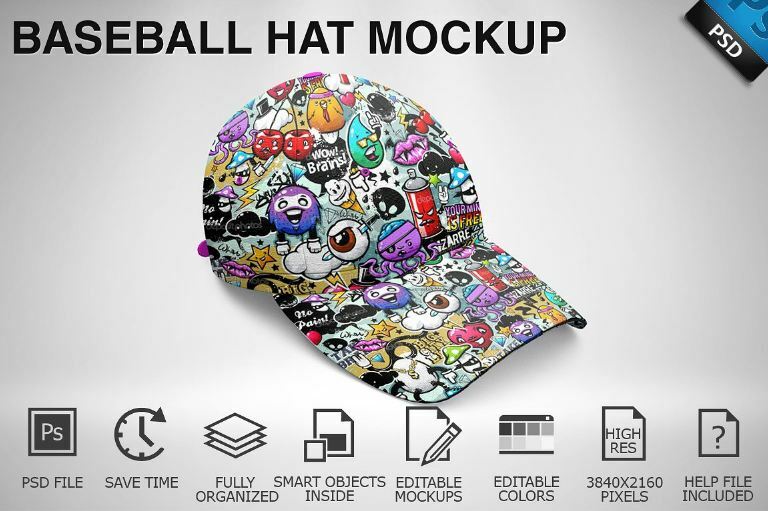 Comes with one psd file, easily change the designs of the baseball cap through smart objects in Adobe Photoshop, background and shadows are separated for editor’s comfort, file resolution 5108×3626 px / 72 dpi / RGB Mode. The Instructions files are also included for user’s convenience. Please note that the logos and the fonts that have been used in the demo file are just for display purpose only, they are not included in the final down-loadable file. A cool hip-hop baseball cap mockup set (by HiMockUp) with 9 high resolution psd files for a super professional presentation of your new baseball caps for hip-hop customers. 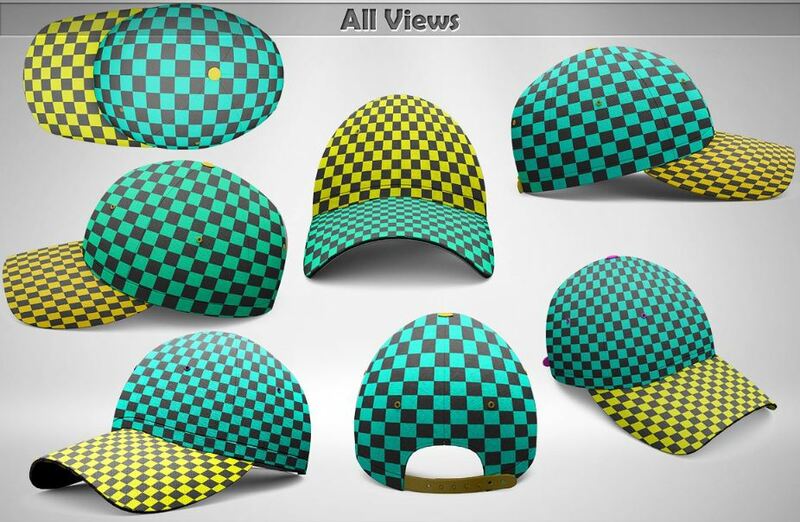 You can choose this set to create and sell your unique and cool baseball cap designs. All the instructions are given (video tutorial) so that you can easily accomplish the editing task in simple steps. This pack includes 5400×3600 px psd files, 9 piece of mockup files, transparent background. Do check out the text and video instructions to get the ultimate photo realistic results as shown by the author on the demo images. 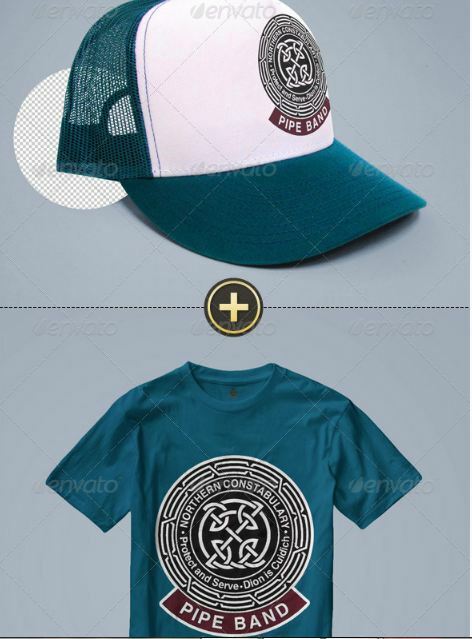 This set is also one of the best sellers in baseball cap mock up section. 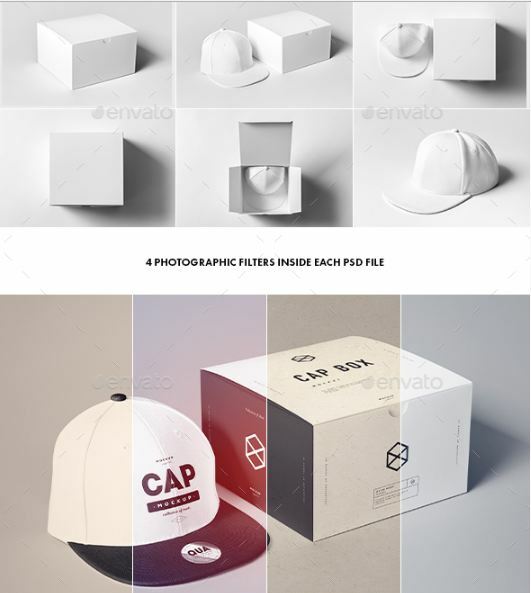 A cap mock up template set with six different scene to create your simple presentation, created by masterpixdesign. Includes options to use any color or pattern, fully separated smart objects, 5000×3400px resolution psd files and a help file. 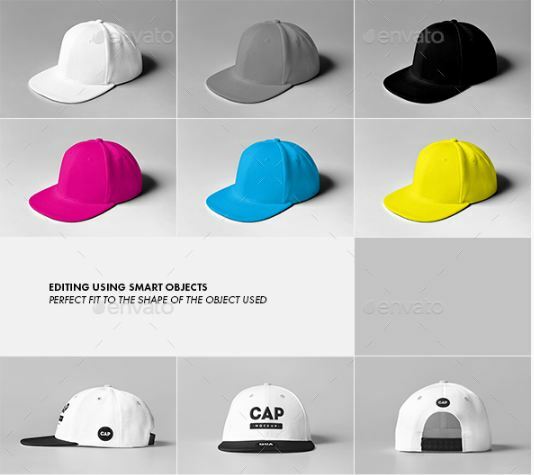 A very simple cap mock-up psd set with seven different view angles, created by graphicriver elite author yogurt86. You will get four photographic filters inside each psd file. 7 individual views and total 8 psd files in this pack. Easily change the background, colors, patterns and other design materials in Photoshop. Are you looking for a mockup set which will help you to create presentations for both your cap and the box or packaging that the cap will come in? I mean, for total branding of your newly designed cap, this cap and box mockup will come in handy. This set promises an attractive look for dark and bright designs. Pack includes 6 super photo-realistic presentation psd files of high resolution (3000×2008 pixel resolution in 300 dpi quality), automatic background perspective (backgrounds are also changeable), includes the effect of convex embroidery, options to insert stickers on the hood, easy to follow instruction file etc. A neat set of professional cap mockup psd set from robbiewilliams, comes with High resolution (3000×2200px) psd files. 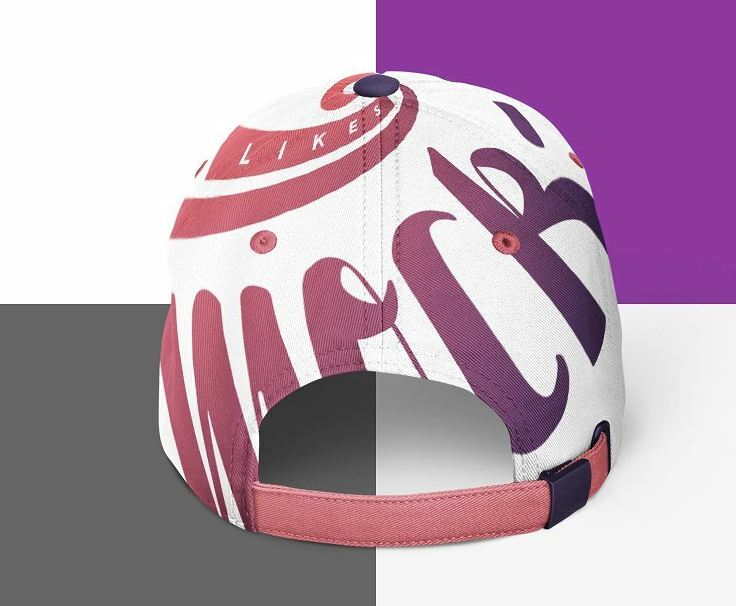 Easily change color, patterns and other design elements of this cap mock up in Adobe Photoshop. Simple guide is included in the set. 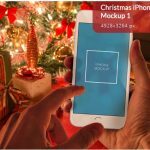 You will get 14 high resolution cap mockup psd files (5600×4000 px) done with super professional female model photographs which will enable you to create photo-realistic mockups in minutes. 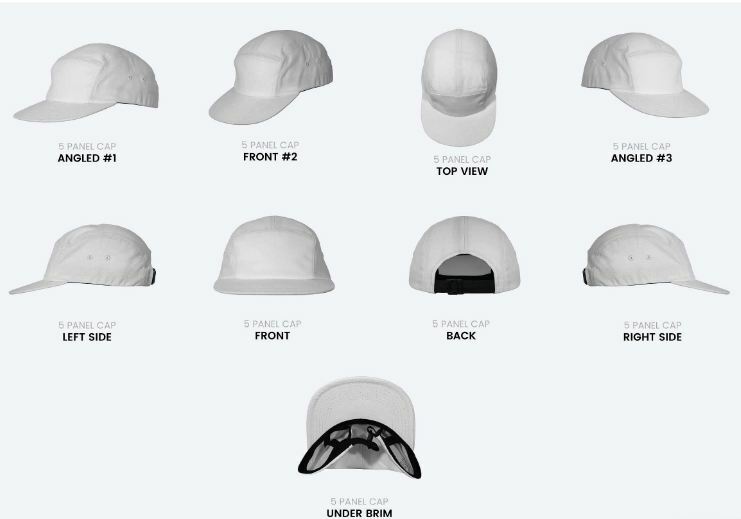 Will also get both text and video instructions on how to get the final product with this female baseball cap mock up set. 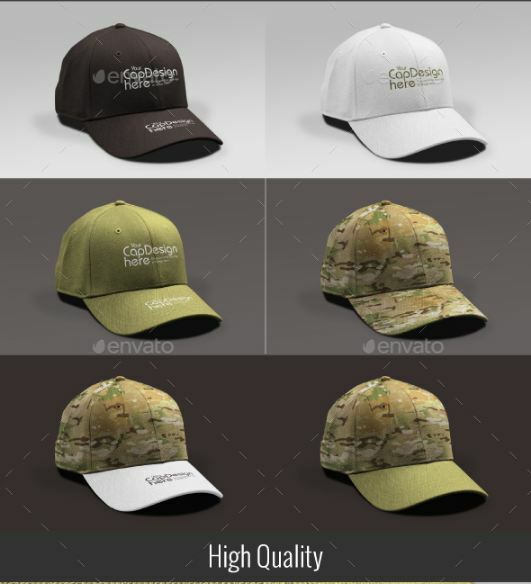 Created by gaidukdesign, a highly professional baseball cap mockup set to use for your on-line store presentation or any other design showcase for caps. Fully editable Photoshop file comes with 8 different shots. 3 Ultra professional backgrounds are designed and included in the download- wood background, black background and white background. 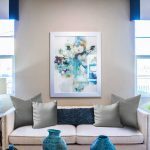 Author of the product says you can create thousands of different designs by combining the given design elements. You can customize the color of holes on top, color of seams, color of the main cap in template, color of ground and back. The logo in demo images is not included in the download. A popular combo mockup template set by X-Mail in graphicriver. 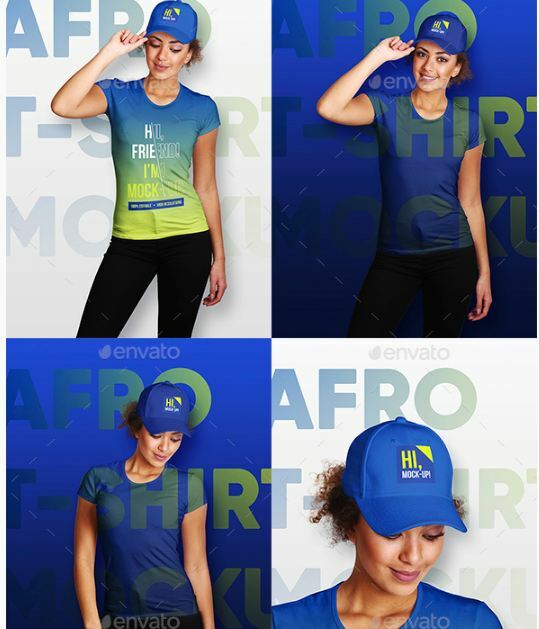 By purchasing this pack, you will get 2 high quality mockup set of T shirt and trucker hat template. For your easy to do design gigs- professional design, changeable color schemes and custom logo. Meet 2 different design needs in one download. This set is designed and created by Sanchi477 in graphicriver, will provide you 5 different trucker hat template, where you can add your own patterns, textures, text, logos, design and even change the stitch color simply by copying and pasting into the designated layers in Adobe Photoshop. File resolution of this mockup is pretty high- 2000 × 2000 pixels at 72dpi, and the color mode is in RGB just so you know. Please note that the Baseball cap textures-designs that you see in the preview images are not included in the item purchase. 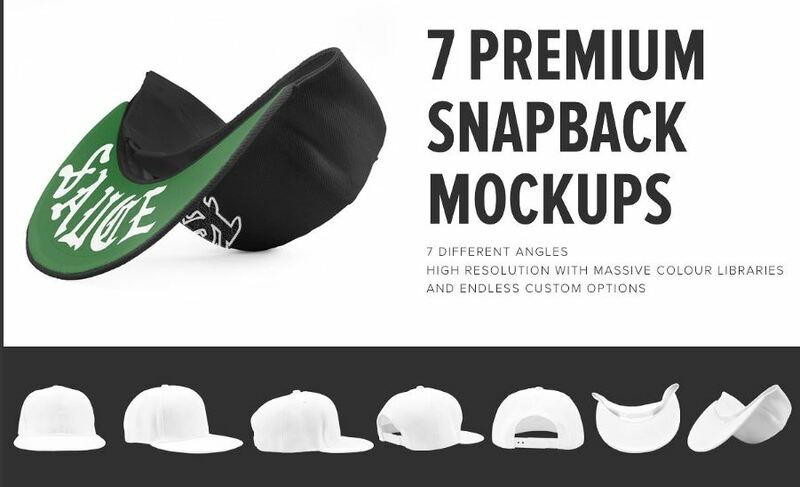 Get eight different exclusive perspective of snap-back baseball caps with this premium mock-up set. Comes with fully layered and properly named high resolution psd files – 3000×2250 pixels (10×7.5 inches 300dpi for high quality print cap printing needs). Designers have the option to adjust shadow, effect of light and reflects changing to appropriate transparency layers – shadow / reflect/ light over etc. Created by L5Design in graphicriver. This is a highly professional baseball cap with realistic embroidered logo mock up. 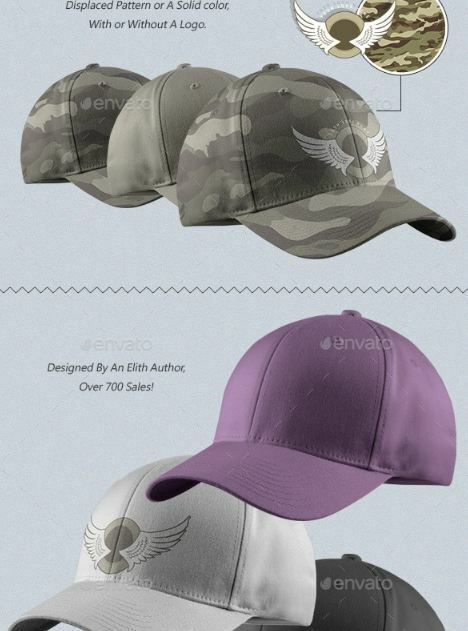 So you have the easiest way to present your embroidered logo on a cap to the client. You will get 4 psd files for Photoshop with organized layers and 2500×2500px with 300dpi resolution. This mockup is designed and created by YRaBD in graphicriver.net. Are you searching for bucket hat mockups? Well, here is a wonderful bucket hat mockup psd template pack to fulfill your bucket hat design needs. It’s created by bangingjoints. This bucket hat mock up bundle comes with a whooping 23 psd files, to cover almost any bucket hat mock up view you might need. 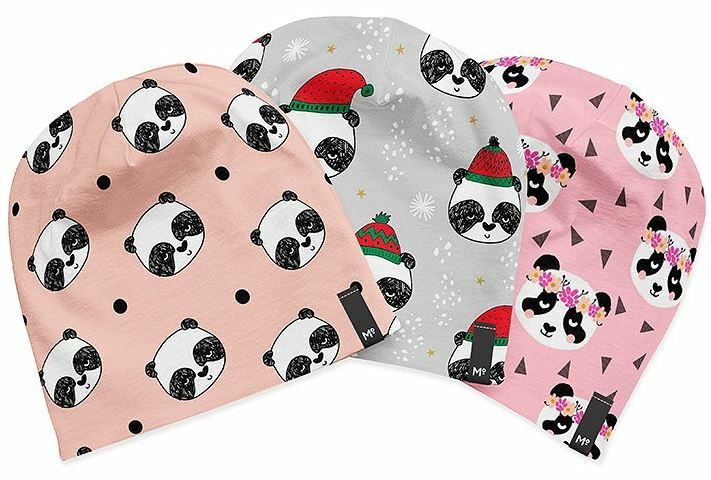 This bucket hat collection features Smart object for Logo, Reflection and Shadow layers, Photo realistic views, Smart object for Pattern, Custom Colors to choose from. It also includes 5 hat types- white cotton hat, black cotton hat, denim color hat, denim hat and color cotton hat. Size/resolution of the files: 4000×2250 pixels. A very good polo cap mock-up psd with embroidered logo template from YRaBD. Easily present your custom patterns/logo designs to a client through this polo cap. The file features- 2000×2000 px with 200dpi resolution, changeable colors, four different PSD files with well organized layers, effortless editing with Photoshop smart objects. You can place your custom logo or other design image with transparent background. A cool leather baseball hat mockup with an option for embroidered logo design placement. This leather baseball hat template will enable you to convert your designs into an embroidered patch on a leather cap automatically and furthermore with an ease. This leather hat template uses displacement maps to perfectly wrap your custom design around the front side of the cap. 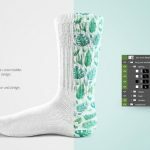 Download includes a PDF with instructions, 2 fully layered PSD files, embroidery pattern PAT file for Photoshop, two displacement map PSD files. A trucker hat– also known as netback cap or mesh cap is a kind of baseball cap. It’s also know as gimme or feed cap because the style of this sort of hat had begun during 1960s when U.S. farming supply companies gave these away as a promotional give-away to truck drivers, farmers and other rural workers. 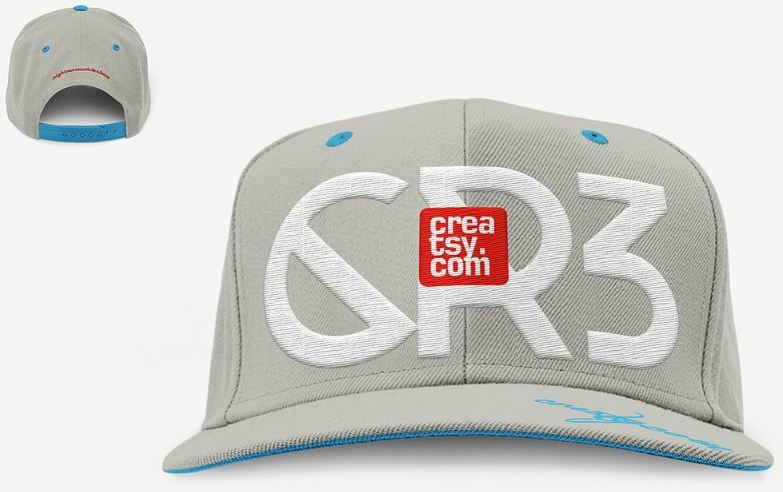 2) Here is another one – How to Design A Photorealistic Custom Hat/Cap Mockup in Photoshop by Robert Loyale.